Star Bite: Hankerin' for halibut? Often we'll get recipe ideas from other news sources .... and have no idea where to tell readers to acquire things such as spelt flour or kangaroo. Across our radar screen today comes a notice from Marx Foods, an online specialty store in Seattle, that says the Pacific halibut season is in, and diners from across the country can place their orders. This stuff isn't cheap -- $16 per pound, and that doesn't include shipping. However, if you're in the mood for something unusual and just want to do some cyber-window shopping, check out the site. It has a variety of sausages, exotic meats (ostrich, kangaroo, bison, etc. ), specialty flours and grains, and an interesting line of seafood products. Don't go looking for bargains. This is special occasion shopping. About the halibut: Pacific Halibut season has just opened. It's caught off the coasts of Alaska, Canada, Washington and Russia. 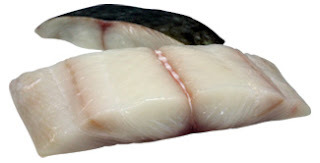 Halibut has a firm, flaky texture and is very white in color, with a slightly sweet taste. Eaten fresh, it has a very clean flavor and requires minimal seasoning. Cooking methods are endless including broiling, smoking, baking, frying, and grilling. It’s a great fish to have as a main dish with fresh herbs or to use as an ingredient in fish tacos, bouillabaisse, curry or pasta. Pacific Halibut is the largest fish of all the flatfish species, with the highest recorded weighing in at almost 500 pounds. More commonly, they weigh between 10 and 200 pounds. An individual vessel quota system has increased the availability of fresh halibut, as well as the quality of the fish.